My kids and I love soup. My husband does not. But we have been able to compromise and find some soups that he is willing to eat, so I don't have to spend the rest of my days not being able to eat soup. :-) One of these compromises is taco soup. Actually that is not the name for it. I could never remember the name for this soup, so I named it taco soup because of the taco seasoning that goes in it. I believe it is called something like Mexican Soup. But for the life of me I really can't remember. I actually got this recipe from my mom about 25 years ago, so it fits perfectly with my throw-back-Thursday recipes. It was a nice change from the regular chili that we always had and for awhile this recipe became one of our family's staples while I was in high school and college. One of the things that I love about this recipe is that you don't have to follow it. 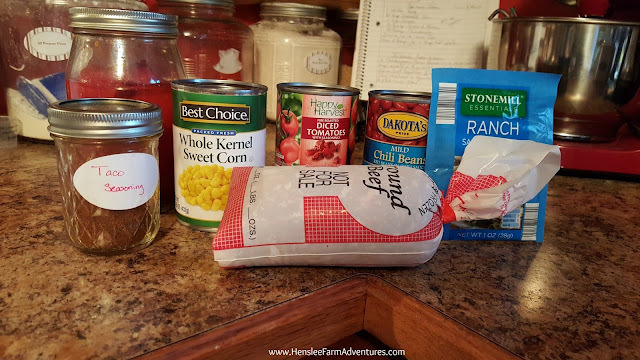 So long as you stick to the basic flavorings, then you can mix up those ingredients with whatever you have on hand in the pantry. And I have done that on many occasions. This really isn't all of them, I would add another can of beans. As you can see from my ingredients that I have pictured I don't follow the recipe. I like to use a jar of home canned tomatoes along with a can of chili ready tomatoes. If I have a can of diced tomatoes and green chilies in my pantry, then I will throw that in. It gives it some nice heat. 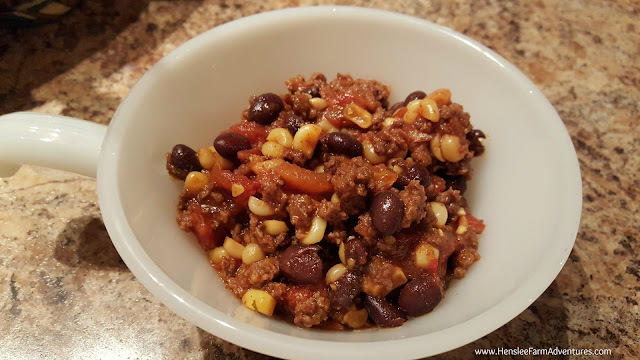 I also like to use chili beans rather than kidney beans and if I have black beans I will use them and if not, I just throw in another can of chili beans. If you don't have either you could really use any beans that you have (except green beans...yuck!) On the meat, if you are a vegetarian you could leave that out altogether, or use ground beef, deer, or turkey. All would be good! For the seasonings, I make my own taco seasoning that I like to use. I have yet to find a homemade version of ranch seasoning that is flavorful enough for me, so I buy the packets from ALDI because they have no MSG in them which is almost unheard of for ranch seasoning! This meal is so easy to make. Brown your meat (if using), then once it is done, combine all the ingredients in a pot. This is where I use my dutch oven so I can brown my hamburger meat and then add in all the ingredients and only have one pot to wash at the end. Let simmer for as long as you can stand it...the longer the better to allow the flavors to come together. And then enjoy! You could also make this in a slow cooker. Once you have browned your meat, dump all the ingredients in a slow cooker and cook on low for 3-4 hours. Nice and thick...just like Steve likes it! You can see above that when I make the soup I try and make it thick. That is for Steve's benefit. Since he does not like soup, he doesn't like anything soupy! Of course depending on how much tomatoes you add in, you can make this thinner if you prefer. This really is a great, quick, and easy meal. It can be very budget friendly when you use items that you already have on hand. And can make a great vegetarian meal by omitting the meat! 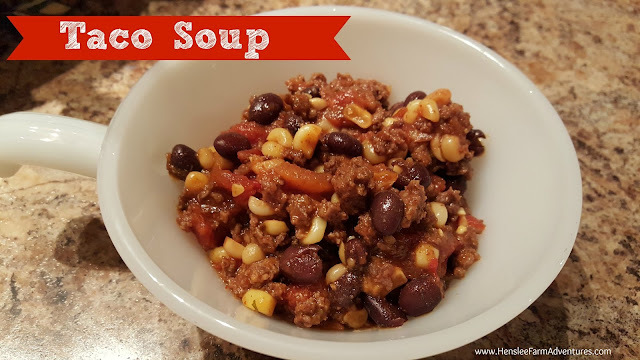 I hope you try one of our favorite soups, and let me know in the comments what you think. To get the printed version of the recipe, click HERE.